MetaMoJi President, Kazunori Ukigawa, and executive director, Hatsuko Ukigawa, were interviewed by flick! 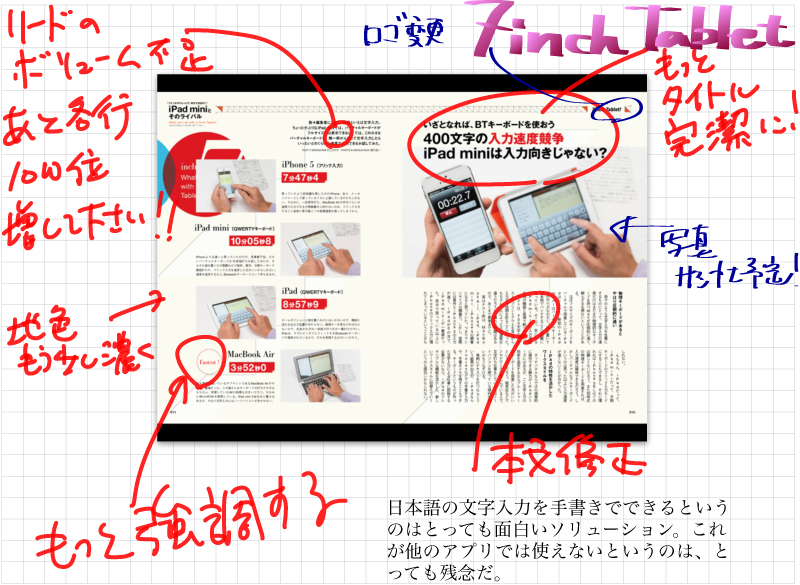 but quickly turned the tables to find out how Flick editor Takuta Murakami creatively uses Note Anytime on his own iPad. “Flick! digital” is a monthly digital publication that reviews gadgets and technology. It is designed to be read using an e-book reader such as the iPad. Every issue is packed with information on iPhone, iPad, Android, and new web services. During the discussion it transpired that Editor-in-Chief of flick!, Takuta Murakami, used his iPad and Note Anytime frequently. We therefore arranged to turn the tables and interview Mr. Murakami to find out how he uses Note Anytime and what he thinks about our app. Kazunori: How do you use Note Anytime? 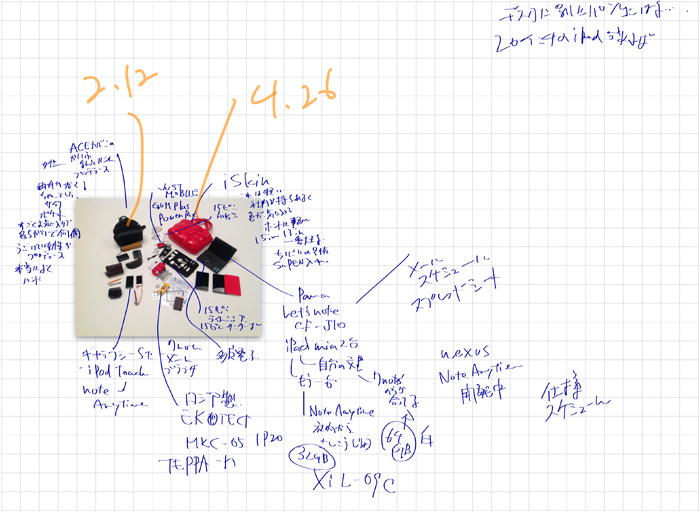 Mr. Murakami: I frequently scribble into Note Anytime capturing ideas and calculations. I find that using handwriting brings out better ideas than when using the keyboard, for example when creating the title for an article. I think this is because the brain is stimulated more when handwriting. Kazunori: How do you use Note Anytime when designing and reviewing articles for flick!? Mr. Murakami: To give my feedback about articles, I capture the original information into Note Anytime and then write my comments onto the document. If I try to do this on my PC I have to write descriptions of where in the original article I am referring, for example: “About picture A, you should…,” and this is very time-consuming and open to misunderstanding. With Note Anytime I can easily and quickly draw and write to highlight exactly what changes and points I wish to make. I am addicted to using Note Anytime for this. Kazunori: What kind of annotations and comments do you add? 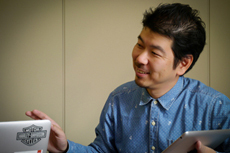 Mr. Murakami: For example, when I receive a submission from a designer, I add change requests such as “I want you to replace the title here” and “I want you to change a picture here.” Before, we exchanged all of this communication using paper. In this case the design office is 200m away. I used to have to print designs one by one, comment on them, and then bring them to that office which took a lot of time. Kazunori: Why use Note Anytime instead of other PDF annotation software? Mr. Murakami: When I receive a PDF that has been modified the editorial department re-create it to include calibration signs and other printing markup needed by the DTP operator. This loses all annotations that were in place within the PDF. With Note Anytime I can import the new PDF and then apply all of my previous annotations to check that no errors have been made. One other point is that sometimes I cannot read the notes appended to a PDF as it can depend on being viewed in the annotation software used to create it. For example, there is a correction made to the price of the items in an article. When added using some software I cannot see this annotation in my PDF reader. In this case, there is always a risk that I am unaware of changes and publish the wrong information. Kazunori: How does Note Anytime help you to mitigate this risk? Mr. Murakami: Note Anytime allows me to write directly on the pages of a PDF document without affecting it’s format. I can also save these changes in the Digital Cabinet to keep track of changes. As Note Anytime is free it is easy to get other users to download and use it. Kazunori: I’m pleased you are using the Digital Cabinet frequently. By the way, how about the calligraphy pen feature? What is your favorite thing about it? Mr. Murakami: I really like the look of the lines when using the calligraphy style pen. Kazunori: An accurate looking calligraphy pen is the function that I wanted to achieve the most within Note Anytime. Mr. Murakami: When I was a junior high school student, I liked the writing style that you can create with a calligraphy pen. I bought one and wrote various things. Kazunori: Do you use photos in Note Anytime? Mr. Murakami: I regularly add a memo on photos. When I conduct interviews sometimes I don’t know what certain things are and it helps me to capture new information. For example, in the past I made a book of tropical fish. I didn’t know the name of the coral in the aquarium and there are hundreds of kinds of coral, even though they all seem similar to me. 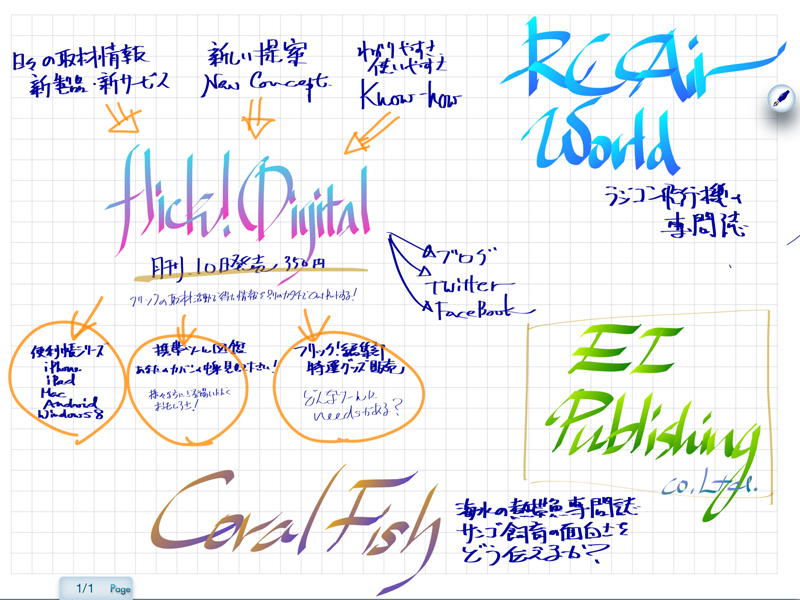 At that time I had to draw a sketch of the aquarium on my notes, and then add the name of the coral as I heard them during the interview. If I had had Note Anytime then I could have taken a photograph of the aquarium and made notes onto the image directly! Kazunori: What advice do you have for anyone wanted to get started with Note Anytime? Mr. Murakami: I think Note Anytime is very useful once you start to use it, but I think that there are some people who don’t know how to get started with Note Anytime. In this case, they should watch the tutorial videos that come with the app to be aware of the powerful features that are available. Kazunori: The videos which explain how to use Note Anytime are available from Note Anytime and also YouTube. I want users to watch them and to give us feedback on where we can give better information and also for them to request new features. Mr. Murakami: By the way, I have a request. When I change the size of my favorite pens, all sizes are changed. I would like you to remember the individual sizes! Hatsuko: Thank you for the request! We will consider this. Kazunori: And thank you for the interview.